The Kalashnikovs that have out gunned and out ranged the western 5.56mm rifles and LMGs were actually PKMs, which are general purpose machineguns in 7.62 x 54r calibre. Actually in almost all those long range engagements (in particular in mountainous, near hill and desert environments) and representing, from a document of US Army itself about 61 % of small calibre fire engagements in Afghanistan and 57% in Iraq theatre) the small calibre fire was always a mix of LMGs and AK-47 fire that ,thanks to the far greater aerodynamic coefficient and muzzle energy of 7,62mm rounds, posed ISAF units in enormous disadvantage. This is proved by a great amount of battlefield events ; for example the "Screaming Eagles" - US Army 101st Airborne ,an "elite" division and one of the better trained and equipped of the whole US Army - after having witnessed ,in the opening stage of a series of operations in the Afghanistan's mountains, the total uselessness of theirs M-16's 5,56 mm rounds in fighting "insurgents" capable to effectively engage them at over the doubloe of the effective range of theirs standard main weapon, waiting that in the theatre would came the modified M-14s that them had urgently requested , was forced to employ in the meantime samples of the same AK-47 that was used against them captured in pasted operations ! "The Army itself demonstrated proof of the M16’s obsolescence when the 101st Airborne and other units started using significantly enhanced 7.62 mm M14s in Afghanistan in mountain battles where the M16A4 and M249 proved basically useless. In the interim, the soldiers themselves used captured AK-47s to better compete in the mountainous terrain. As the title of this article emphasizes, we are clearly outgunned, and that situation will continue as we fight a geo-diverse global war on terrorism and face advanced new weapons, such as the AK-12, the 5th-generation Russian AK." A hit at 600m is unlikely by either rifle so the conclusions are irrelevant. More importantly the lethality of both rounds at such ranges mean a hit would be largely meaningless anyway. The lethality of the two calibres at similar distances (and surprisingly also at much lower range) is a whole world apart. Just to provide you a measure at equal overall conditions, a 7,62 mm round at 600 m deliver on target the same energy of a 5,56 mm round at...190 m !! Not only, but 5,56 mm rounds lose at a far greater rate speed for over-median range and are also much more susceptible to the cross-wind solicitations ,humidity channelling and axis stability ; all of that contribute to exacerbate even more the already strongly limited capability to engage enemy warfighters at the grow of the range over the 220-230 meter's threshold . "Compared to 7.62 mm ammunition, 5.56 mm bullets have less than half the mass (4.0 g versus 9.33 g), and only half the energy at the muzzle (1,730 J versus 3,352 J)13. The 5.56 mm bullet is also less aerodynamic, which means it loses its initial velocity and energy more quickly. The laws of physics mean that 5.56 mm ammunition by definition has a shorter overall range, a reduced ability to retain energy at longer ranges and makes a smaller wound channel when it hits a target." Within 300m the 5.45mm round is effective... ask Vlad... he seems to be happy with it. I repeat one more time ,is important that any operative is confident on the equipment it employ on the battlefield but that don't cancel problems linked to physics ballistic fundamentals. Permanent tissue wounds incompatible with live and capable to generate substantial attrition on effectives of a powerful enemy Army in a protracted war -the real aim that should always guide the design of the main weapon for any branch of Armed Forces - is the product of round's radial fragmentation. The supposed expanded wounding caused by the yaw-induced tumbling effect ,moreover directly linked to speed of intrusion at its own time dramatically decreasing at ranges greater than 250 m for 5,56 mm and 5,45 mm ammunitions has been demonstrated experimentally and on the battlefield to happen in the minority of the instances and with effects very very far from those "sold" previously theirs introduction,. Aimed special mission in Daghestan or police operations against separatists can only screen the total unsuitability of 5,45 mm rounds as central ammunition for Russian Army Infantry's main weapon for fight a strong enemy in an high intensity large scale War ,but those days the long series of latest low intensity local conflicts seem to have literally sedated the analytical and critical thinking of majority of military planners worldwide. The result ,usually is a very abrupt awakening coming from the battlefield (like for 5,56 round's performances and average range of engagement so far from what planned or...hoped). How could a 7.62x39 AK be better at long range than a 5.56x45? The 7.62x39 has a lot more drop. Unless we're talking about wind. The 5.56x45 is theoretically more effected by wind. I think if expanding bullets were allowed in war, they could solve some lethality problems with the 5.56x45 and 5.45x39. From a purely physics point of view the heavier AK bullet will have more weight so it will retain velocity better, though another component of that is ballistic coefficient.. in other words a long slim heavy bullet design like the 5.45mm will retain velocity much better than a short stubby round, or a fat round that is also fairly short for its width. Very simply the air to use seems thin... you could believe there is nothing there, but when you start to push against it... ie run then you start to feel its effect. Stick your hand out the window of a car on the highway and feel the force of the wind then. When a bullet travelling at supersonic speeds moves through the air the force of the wind it enormous and it rapidly slows the bullet down... a 308 full power rifle bullet might travel 3-4km but it is only supersonic for the first 1km or less, so it spends most of its time in the air at subsonic speeds. Lighter bullets decellerate much faster. The point is that if all bullets are rushing to slow down to sub sonic speeds then at longer ranges where they have had time to slow down it is the heavier bullets that have the advantage. It is like the difference between throwing a balloon filled with normal air and a baseball... using the same amount of force to throw both the baseball will travel further because it has a smaller area so it is pushing aside less air as it travels, and it also has more mass and therefore more energy to push that air aside. Neither are a particularly aerodynamic shape, but the baseball is better because it is smaller and heavier. A bullet is an even better shape but long slim bullets retain velocity better than shorter and or fatter ones. The new super rounds the people in the US talk about... the 6.5 grendel and the 6.8 Remington if you look at their performance... the 6.5mm with a 130 grain bullet at 750m/s... it is less than 10 grain heavier than the 7.62 x 39mms standard projectile at 750m/s only slightly higher velocity. The only real difference is a slightly smaller calibre... 6.5 vs 7.62. At the end of the day the 6.5 Grendel is based on the .220 Russian, which was also the basis for the 6.5 PPC bench shooting round... all of which was based on the 7.62 x 39mm cartridge. If you wanted a new super cartridge personally I think the best idea would be to use a 140 grain bullet in a 7.62 x 39mm case with more modern, more powerful powder that blows it out the barrel at 820m/s or so, which would pretty much make it a compact 303 cartridge. The real problem with using Afghanistan as an example is the fact that the enemy will adapt their attacks and their methods to what you have... if the NATO forces had all 7.62 x 51mm heavy rifles optimised for long range then the Taleban will get in close and fight in close with SMGs and assault rifles. If NATO forces have all 5.56mm rifles then they will do what they have been doing and shooting from 400m+. The key point is that when you hear about foreign soldiers dying in Afghanistan most of the time it is because of an IED attack, or more recently because an afghan soldier turned his weapon on his trainers. Experience might say the Afghans are attacking outside the reach of the 5.56mm round but how effective is that actually for them? Firing from 400m or more means poor accuracy and low hit probability. Yes GarryB, but small arms fire is the second cause of death in Afghanistan (and so in Iraq) at an huge distance from the third ; moreover them are the first cause of permanent injuries among ISAF's operatives and first cause of US and UK personel incapacitation. Theirs toll among US and UK operatives is very heavy and very often generated just by this out-ranging and out-powering overmatch against Talebans. "With the majority of contacts occurring at either very close range or at ranges out to between 500 m and 900 m, the "only organic asset" available to responding UK forces in a small-arms capacity is the 7.62 mm General-Purpose Machine Gun, with MoD sources saying that "5.56 mm weapons lack the reach to engage the enemy at those ranges". "The 5.56 mm is sufficiently lethal at the right range, but troops need 7.62 mm for longer ranges. We should be looking at higher performance rounds with higher lethality at longer range. Research is going to filter into user requirements for the soldier system lethality programme," one MoD source told Jane's ." Because the 5.56mm bullets - used in the standard-issue SA80A2 assault rifle --are smaller and lighter, they are less effective from 300 yards or further away. It means insurgents - who use 7.62mm ammunition for their AK47s - back off and shoot at British troops from greater distances. Half of all battles in Helmand are fought between 300 and 900 yards. ....if the NATO forces had all 7.62 x 51mm heavy rifles optimised for long range then the Taleban will get in close and fight in close with SMGs and assault rifles. If NATO forces have all 5.56mm rifles then they will do what they have been doing and shooting from 400m+. Them -"Insurgents"- already engage...and often.... ISAF's Forces at very reduced range , but as you well know , when that happen it involve fire coming from defilated behind different kind of coverages (from house walls to car's doors ) and also here the difference in coverage penetration between 7,62 ammunition and 5,56 (or 5,45) is simply huge. They are leaving in 2 years, any solution they apply is going to cost more money than it is worth because whatever the solution is their enemy will adapt their tactics to maximise the damage they can do and minimise their exposure to enemy fire. Even if every NATO soldier is issued with a 7.62 x 51mm weapon they will need optics and training to be effective to 600m or more and once they get that... guess what... the taleban will likely try something else... more roadside bombs, sabotage, land mines... they might even bring back the old skill of machine guns, where you sandbag a machine gun into a position on a fixed arc with the target area about 1.5km away and then you set up about 5 more weapons aiming at the same place from quite different positions but from similar ranges and then you set up a spotter with a rifle and perhaps a tracer round as a signal and when an enemy patrol enters the kill zone the spotter fires a tracer round back towards his own troops and they fire 200 round belts from all of the machine guns they had set up at once. It will take about 15-20 seconds to fire off the entire belt and then you take the MGs and leave the area. From 1.5km away it will take about three seconds for the first rounds to start impacting and they will all come in subsonically so you will only hear impacts as 1200 rounds land in the area. As long as there are no tracer rounds in the belts the target probably wont have any idea of what is even happening, the machine gun positions could be under cover and spotting a muzzle flash from 1.5k would be impressive. Of course it is probably just as easy to set up mines... they know the terrain... put mines along walls and in ditches near tracks and when a patrol comes along fire a burst of AK rounds over their heads and then run. They will duck behind the walls and jump into the ditches for cover... The Americans and British taught all this stuff to the Muj in the 1980s. Anything that stops working... change it. I think the people suggesting there is some super calibre that will solve all their problems are being naive, their enemies have been fighting occupiers for centuries... they are not dummies. Trying to make assault rifle rounds into rifle rounds is like trying to make pistol rounds into assault rifle rounds, it is always going to be a compromise. At the moment the small high velocity rounds lack penetration... well make those rounds heavier and you get the penetration but all of a sudden they are not as lethal... redesign them so they tumble and you lose your penetration. In Vietnam, one of the big reasons they stopped issuing the M14 was because of the AK. American soldiers were outgunned at close range. So if everybody had a 7.62x51 rifle again, they would run into the same problem. GarryB wrote: They are leaving in 2 years, any solution they apply is going to cost more money than it is worth because whatever the solution is their enemy will adapt their tactics to maximise the damage they can do and minimise their exposure to enemy fire. A more effective caliber will not make the difference between winning or loosing a war, but it matters to the individual soldier. However, changing calibers is really not worth the money or effort. As you've mentioned, NATO is definitely not going to stay in Afghanistan much longer. The best option for them is to try and improve the 5.56x45 NATO as much as they can as technology improves. Fundamentally what they are realising is that they need a few designated marksmen in their platoons, and that their efforts in terms of LMG like the FN Minimi in 5.56mm are a failure. They basically need to add a couple of SVDS equivalents in each platoon, and replace their LSW and SAW with GPMGs again, but what they also need to do is add cheap unguided rockets like the RPO PDM-A that have effective ranges of up to 800-1,000m range so they don't have to waste very very expensive guided anti tank missiles in the same role. They would have to make a lighter 7.62x51 machine gun if they wanted to replace their 5.56x45's MG's. The FN MAG is too heavy. They need something like the Pecheneg machine gun. Since the 14,5x114mm is well accustomed round that is much more powerful than the 50. why isnt there interest to develop a 14,5mm AMR just as the hungarians did with their gepard? It would be cool to develop a bolt action and and semiauto modernisation of the PTRS with lighter materials and better handling. Hell the AMR will be even more compact if a bullpup layout is devised. I think a custom designed rifle probably is in service, in fact I think the ideal weapon would be the equivalent of the South African 20mm/14.5mm rifle. Except instead of chambering it for a 20mm round and the 14.5mm round, that for Russian use they could use the 23 x 115mm round that was developed from the 14.5mm HMG round. That would mean the same bolt and chamber, but different barrel bore diameters. In fact it would be rather interesting to make a smoothbore barrel version in both calibres optimised for SLAP type rounds. The larger calibre of the 23 x 115mm round would make it even more powerful as the larger calibre would allow for more energy and therefore a higher pressure load. The main issue would be accuracy, but in terms of penetration it would be formidable. Here's interesting article about the current situation of new small arms in Russia. I can't say I agree with him that the Russian military should go to 6.5mm. 5.45mm has been in service for years now. And the Russia military in general is satisfied with the cartridge. Should a new round be adopted, it should not be a conventional cartridge case. But caseless,telescoped case, or something else. Interesting that he is suggesting going back to the 6.5 x 50SR Arisaka Japanese cartridge... as used in 1917 in the Federov avtomat... the first Russian Assault Rifle! I can't say I totally agree with him as the round was not very hotly loaded and would not likely give better performance than a standard 5.45mm cartridge. I do think the 7.62 x 54mm round is ready for replacement as long as they have a round that will perform the role with the lethality, accuracy, and range needed. GarryB wrote: Interesting that he is suggesting going back to the 6.5 x 50SR Arisaka Japanese cartridge... as used in 1917 in the Federov avtomat... the first Russian Assault Rifle! Never knew about this Federov Avtomat! All this noise about the German MP-18 sub-machinegun and how revolutionary it was clearing trenches and so on. And here the Russians already had something that was way ahead of its time. Many western experts claim it doesn't count because the round it uses is not a proper intermediate cartridge, yet in performance terms its 120 grain bullet travelling at about 670m/s from the Avtomats short barrel are not that different from the 122 grain bullet of the standard AK at 720m/s. The smaller calibre of the Japanese round allowing it to retain energy better than the fatter Soviet round, but the target is unlikely to tell them apart. Note that the weapon was named Avtomat, and since then the Russian military has called all its Assault Rifles Avtomat... ie AK, AKM, AS, AN-94 etc. I am starting this thread to cover developments in small arms, mainly significant departures from standard systems. 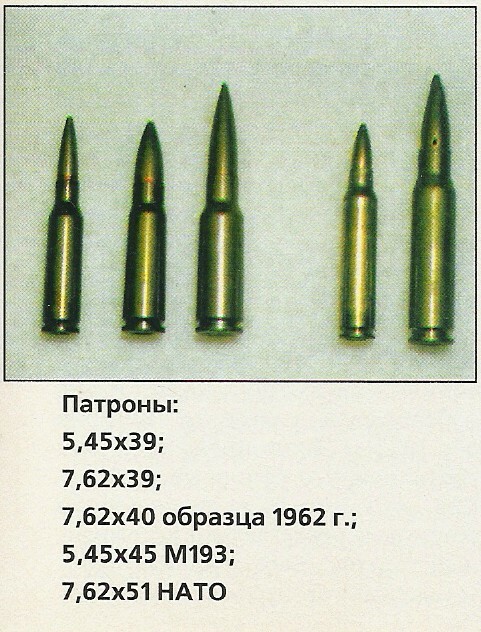 The third round from left is a "1962" 7.62 mm X 40 mm replacement for 7.62 mm X 53 mm (7.62 mm X 54 mm). Back in 80's they tried to unify a round for everything for Dragunovs, Kalaschnikows AK and PKM with the 6x49mm which had 2 times better performance in accuracy and 1.5 times more performance in maintaining its velocity and still had similiar ballistical performance compared to 7.62 x 54mm R.
It was designed to replace the 7.62x54mmR to have a low recoil but still high performance and had 1100-1150m/s fired from PKM barrel. To bad they didn't got it into service even as an alternative. One aspect of the 6X49 round that is worth mentioning is the groove that is in front of the extractor groove. I think, this groove plays a very important role in improving the packing efficiency of the round. Similar techniques are commonly used in the gun ammunition design (i.e. for calibers of larger or equal to 20 mm), but this is the first publicized use of the technique in small arm applications that I am aware of. The functioning of this feature is as follows. In order to increase the reliability of extracting a spent case, the case can be designed to incorporate a truncated conical section. Such a design allows for reliable extraction of the spent cases, but volumetrically, such a design is not very efficient, the reason being that a truncated cone has a smaller volume than the volume of a cylinder of equal base dimension. The solution used in the gun ammunition design is to use an essentially cylindrical case, hence providing a good packing efficiency, but making the case slightly deformable in such a way that during the extraction the case gets deformed, loosing friction with the inside surface of the breach and allowing for easy extraction of the spent cases. The groove in the 6X49 round that I am referring to provides for a similar functionality in the essentially cylindrical case of the 6X49 round. This groove has a semicircular cross-section; therefore, it is strong with respect to resisting the expansion forces of the propellant gases, but it is weak with respect to the axial forces generated during the extraction process, allowing for the deformation of the case and providing for a reliable extraction phase. To be honest i have never heared of such engineering methods for extracting ammunition cases. Are you suggesting the round is belted? It certainly seems to have a high muzzle velocity for the bullet weight. GarryB wrote: Are you suggesting the round is belted? As can be seen from the picture, the round is not belted, nor is there any reason to belt the round, as belting is generally used for headspacing a round with a geometry that may otherwise be difficult to headspace. With respect to its high muzzle velocity, of course, this round is a very high-performance round. This is expected, or it would have never been considered as a 7.62X54R replacement. I think, the explanation I have given in my previous post, highlights one of the technological aspects that makes this round such a high-performance round. thank You guys for posting this. Looks really interesting. Too bad Soviet union had allergy to new things and so many promising ahead of it's time projects were shelved. It looks that today's Russia is more open-minded. Any news about new calibre they are working on? I have read they are working on a super long range sniper rifle calibre that is in the 9mm calibre range... perhaps related to their experience with the .338 LM round? They have also developed standard 5.45 x 39mm and 9 x 19mm under water rounds that fire super cavitating darts. Regarding the unified cartridge I have only seen applications showing a replacement for the 7.62 x 54mm calibre... ie PKM and SVD. Let's talk about the SP-10 7N29 (9x21) round, from what I heard it has amazing armor penetration characteristics, such as being capable of near 100% successful penetration of 30 layers of Kevlar plus up to 2.8mm titanium plate at 100 meters!!! That's truly insane armor penetration characteristics, is there any more information about this?